Welcome to the St Lawrence String Quartet 2016 review minisite. To continue, please scroll down and use your browser's back button to navigate this subsection of our website. The links above will take you to the main area of slsq.com, which is freely navigable by the public. We encourage you to look around there, but please note that for the purposes of the 2016 review, all relevant materials can be found by starting on this page. The following sections on this web page give an overall view of our professional lives and our careers, focusing in detail on our Stanford activities. In 1998, the St. Lawrence String Quartet (SLSQ) joined Stanford University’s distinguished faculty. In the eighteen years since that time, we have been grateful for the opportunity to become part of the vibrant and diverse Stanford community, making Stanford our place of residence and a true home for us. Although we travel extensively in our role as an internationally performing ensemble, we maintain a strong presence on campus, teaching, performing, rehearsing, and participating in a wide range of university activities. As Ensemble-in-Residence, we teach private students and chamber music groups, and we organize and administer the student chamber music program. The program has grown significantly since we joined the Stanford community, in size and quality, and it provides our hugely talented pool of Stanford student musicians the opportunity to study chamber music in a structured, positive, and energized environment. 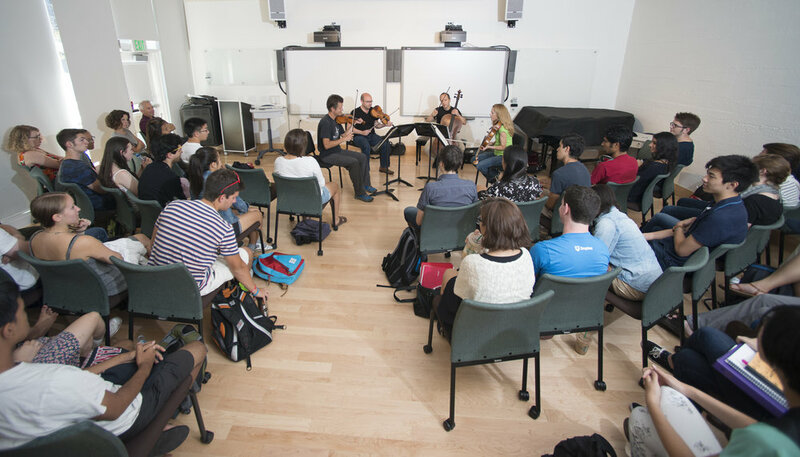 Our Stanford campus activities reach far beyond the walls of the Braun Music Center and consist of quartet presentations and performances at Stanford Live and other venues that take music outside of traditional performance settings. In addition, we have established a track record of excellence in mentoring the next generation of young professional quartets who enable us to reach even greater numbers of people during their biannual visits to campus as part of our Emerging String Quartet Program. One important way in which we contribute to the intellectual life of the University is through our appearances in regularly scheduled Stanford academic classes, and we have enthusiastically embraced new technology in those efforts. 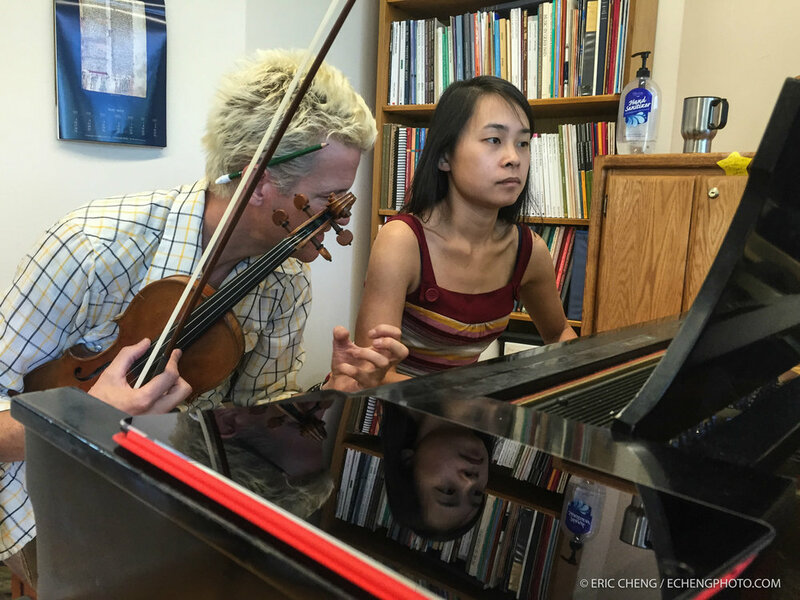 In many ways the embodiment of our philosophy of inclusivity and excellence in chamber music, our well-known annual Summer Chamber Music Seminar draws devoted student, amateur and professional participants from around the world to the Stanford Campus for a ten-day intensive experience. The SLSQ has been devoted to the creation of new works since its founding in 1989. Dozens of new quartets have been commissioned for the SLSQ, resulting in works by John Adams, Jonathan Berger, Samuel Carl Adams, Osvaldo Golijov, George Tsontakis, Ellen Taaffe Zwilich, and many others. Our commitment to presenting the ever-expanding string quartet literature remains at the center of our lives as artists. The concert stage is where we feel most at home and in our 26th season we remain one of the most active performing chamber ensembles in the world. The SLSQ has returned several times to the studio since 2009, producing premiere recordings of repertoire we are closely associated with—most notably the recent quartet works of John Adams. The most current project takes a new look at Haydn: a cinematic HD video rendition of his complete set of Op. 20 string quartets, to be released universally, for free, on YouTube.